Pudget: Losing Weight On a Budget! : A Really Great Giveaway!!!! Check out these bags!!! Are they not the cutest things you have ever seen?!! A few months ago Brandy Switzer, Independent Consultant for Thirty-One Gifts, asked me to review one of her "Thirty-One" bags. Of course I was very eager. If you have ever seen Thirty-One Gifts products before you will completely understand. If you have never seen their products just look at the pictures I posted and you too will understand. Their bags are awesome! I was very pleasantly surprised when Brandy gave me a Shoulder Organizing Bag (like the ones pictured above) to review for her. I had been eyeing them up all summer long so I was thrilled to finally have one of my own. Many of my friends had purchased one this past summer and they all looked so adorable and said they loved them. I was more then excited to be able to try one out for myself. Thirty-One Gifts did not let me down. My bag not only is adorable but it is the perfect every day bag. I have carried this bag every day for approximately six months and I love it as much today as I did the day I received it. It has been perfect for me as a Mom of little one's. I have been able to stuff it with everything I need and throw it over my shoulder while I am on the run. At first I wasn't sure if it would hold everything I like to carry with me but I was very happy when I realized at it held everything I needed plus some. It really is the perfect bag. Just when I thought Thirty-One Gifts couldn't get any better they came out with their new Spring Catalog! Seriously, you need to check it out. I am in love with so many new styles and patterns. They are so, so cute! The bag that I want to buy is here. It is letter R. The XXL Everyday Tote. It will be perfect for the Spring and Summer when we go on day trips to the park, lake, swimming, and any other place we decide to go. It is huge and will hold everything we need. 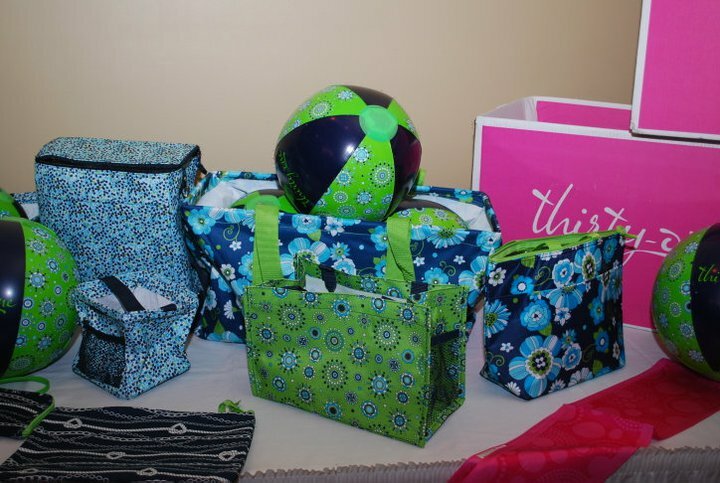 Check out the pictures below of some of the items in Thirty-One Gifts new Spring catalog. I just love the pattens! Click here to view the entire catalog. You can place an order online or have an online or home party with Brandy by contacting her through her site. Brandy is giving one of my readers a Shoulder Organizing Bag and a $20 Gift Certificate!!! This is an awesome prize! I am so excited about this giveaway! 2. 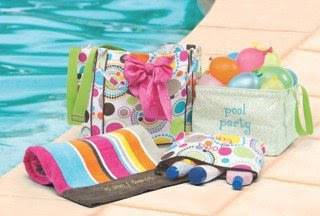 For a second entry visit Brandy's Thirty-One Gifts page here and tell me your favorite item. 5. For a fifth entry click "Like" on Brandy's Thirty-One Gifts Facebook page and come back and tell me. The Winner will be chosen using a random number generator. All entries must be received by Monday, March. 14, 2011 at 11:59 CST. The winner will be announced Tuesday, March. 15, 2011 For U.S Addresses Only. This review is my honest opinion of Thirty-One Gifts. Would LOVE to win the Thirty One bag! They have SUCH cute stuff! I love your give a ways! Better than that, I love your opinions on what you think of the items. I've been eyeing those bags up for awhile now too! I would love to get the large utility tote. Perfect for summer outing with kiddos. I am a Pudget Follower! I liked Brndy's Facebook page! Wow how come I have never heard of these? Hope I win. Love them. I like the Demi Purse! I am a "senior citizen", so don't know if the bag would look appropriate, but have a DIL who would love it as a gift. I looked at her 31 page and my favorite is the skirt purse. So trendy and economical b/c you can make it a totally different purse for cheap. I would sooo love to win one of those cute bags! Beaut-i-fi-ful! Cute! Yes!!! I love Thirty One bags. I would love to win one. The hard thing would be deciding which one! It's really hard to pick just one thing, so I'll say the Cindy bag or the Utility bin. I love almost every single thing in the catalog! I've seen these a bunch around the blogosphere and they're adorable. Would love to have one! Great fabric selections! Super Cute! My favorite item on her site is the fold-n-go organizer. Great job on the loss and I totally feel ya with the money for WW. I was doing monthly but it racks up on the credit card! Switched to paying weekly and I don't know how long that'll last. We shall see! Wow, can I say all of them I'd take. In reality, I'd probably go with the large tote for the swim club during the summer. The patterns are beautiful! "Like"d Brandy's Thirty-One Gifts on Facebook. Those bags are too cute! I would love to win one. would love to win a bag...also, I'm a follower...do I need to post that in a separate comment? my favorite item is the xxl everyday tote - looks perfect for the beach! I was just thinking I could use a new purse/bag. :) The Thirty-One bags are adorable! I think my fave item is the Pop Crossbody! I posted your giveaway on my fb page! I am always on the lookout for a new fabulous bag! These bags are so cute! I would love to have one. I would love the thermal tote also! I love the utility bags...that would be great in the trunk of my car! I'd like the utility tote. I think 31 bags are very cute. I haven't purchased anything from them but have wanted to. I don't own a 31 bag but they are cute. I wish I did have one. I <3 31 products. Can never have too many of their bags!! !